As someone raised on metal during the golden age of thrash, I’ve come to expect bands to adhere to a few basic, immutable laws when crafting new thrash platters. Firstly, keep the songs short. Secondly, keep the overall album length under 45 minutes (the more under the better). And lastly, bring the appropriate level of enthusiasm and kinetic energy to the task. Germany’s Exumer has been around since the 80s themselves, and they have a pretty good grasp on what it takes to craft a successful slab o’ thrash. I still enjoy their Possessed By Fire debut all these years later, and 2016s The Raging Tides had its share of sweet aggression despite some shortcomings. Now they’ve come back to bludgeon with their fifth album, Hostile Defiance, and lo and behold, all the essential rules are followed and their mosh ducks are in a neat row, ready to rumble. This looks like a promising development. As with all their comeback releases, they’ve taken the Bay Area sound to heart, especially that of early Exodus, but they don’t totally forsake their Teutonic roots, as jagged bits of Kreator and Destruction appear to spice and slice up their writing. The opening title track is a manic, hysteria-inducing bit of unholy cross-breeding between Exodus and Kreator, setting a harsh, aggressive tone and leaving no doubt where the album is headed. The riffs are chaotic, the vocals are frantic and it all sounds like a multi-car pileup on a burning interstate (that’s a good thing), but little windows of relative respite are offered at chorus time. “Raptor” drops the insanity back a notch for a crunchy, riffy, pummel-fest loaded with lunkheaded machismo. It sounds like Terrible Certainty-era Kreator sucker punching a drunken Exodus in the greasy back alley behind an OTB, and that’s exactly the kind of stuff I want, making every day alright for fighting. There’s even impressive solo-work to act as the bloody cherry on your adrenaline and steroid smoothy. It’s not high art, but it is a ton of friendly violent fun. Followup cuts like “Carnage Rider” and “Dust Eater” maintain the merciless beating while sustaining an unhealthy level of histrionics, and in the latter case, delivers a nostalgically toxic dose of Fabulous Disaster-esque riffage. The band dabbles in slightly diverse textures on “Descent” with its vaguely blackened edge, while “The Order of Shadows” infuses the riffs with old timey classic metal ideas for an interesting departure from standard oppressing procedure. No song feels like filler or reaches the 5-minute mark, and at a short, sharp 38 minutes, the album burns brightly from start to finish, leaving you battered, bruised and entertained. Mem Von Stein still has it as a thrash vocalist, sounding like a rabid mix of Mille Petrozza and Zetro Souza. His harsh snarl suits the material well and there’s just enough variation in his delivery to keep it from getting stale or monotonous. Ray Mensh and Marc Brautigam carve the album with propulsive, angry riffs borrowing from many of the forefathers of thrash. And as riffs are the coin of the thrash realm, it’s good that they brought some of their best to the party. They chug, crunch, rip and tear with hooky leads and harmonies and come solo time, they bring the thunder. Production-wise, things are dominated by the guitars, which have a hard, biting tone, and as you might expect, T. Schiavo’s bass is only passingly present, and as if by genre by-law, he’s left lurking much of the time. The mix is loud, but not unduly so, and the overall effect adds to the material’s nervous breakdown aesthetic. 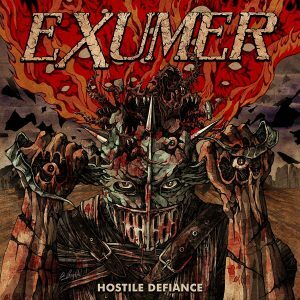 Hostile Defiance is a no frills, zero nonsense thrash album that manages to stay true to the golden age without sounding like a moldy retro relic. It may be short on innovation, but it shows Exumer hitting a late career stride and churning out some of their best material since Possessed By Fire. If 2019 felt like it was suffering from a thrash drought thus far, prepare to be deluged with quality aggression. Way to go, you olde thrash dawgs!